I’ve become a major smoothie bowl addict. I could eat one for breakfast pretty much every single day, and a lot of mornings recently…I have been doing just that. Acai and pitaya bowls are also everywhere in San Diego, so I’ve been picking up my fair share of the bowls at local juice bars too. But for these super warm summer months, with those mornings where I wake up already sweating, I needed something even more refreshing – something more tropical, bright, and fresh. 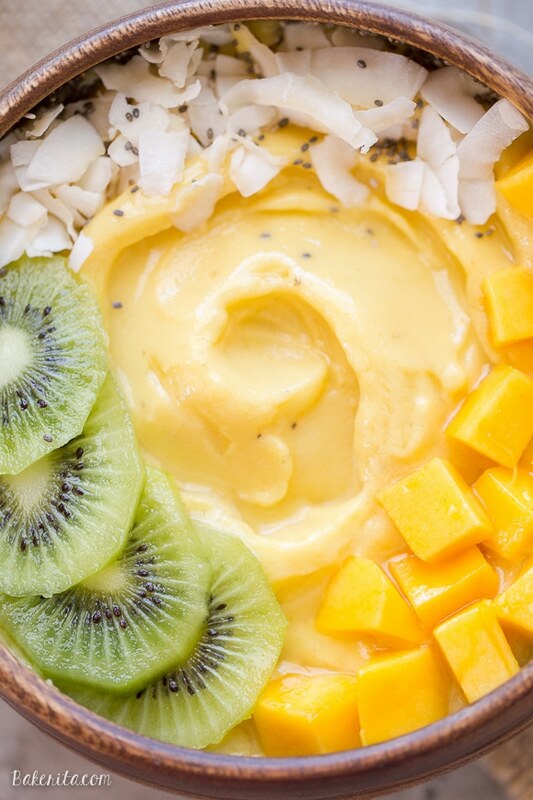 Enter: the mango pineapple smoothie bowl, A.K.A. a vacation to a tropical island in a bowl. It’s so irresistibly bright and fresh, it screams summer. Bonus: it’s only four ingredients! Banana, mango, pineapple, coconut milk, in a blender, pureed ’til smooth. That’s it. I gave measurements of how I do it, but seriously guys, feel free to wing this and add a bit more pineapple or mango if you prefer one, or add another banana for extra creaminess. The milk amount is also adjustable. I like my smoothie bowls really thick and creamy, almost ice cream-like, so I go for a small amount of milk. If you want it thinner and more smoothie-like, use more! Now for the toppings…I go a little crazy here sometimes. 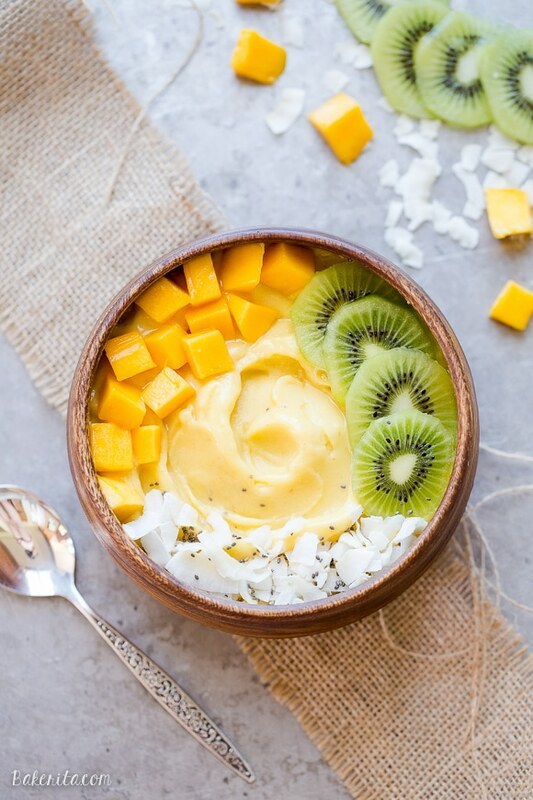 On this bowl, I was obsessed with the kiwi slices, fresh mango and coconut, making things extra tropical. I usually top my bowls with granola for crunch, but between the slightly crunchy coconut flakes and chia seeds I sprinkled on top, my texture loving heart was satisfied – though some macadamia nuts would have definitely been welcome. This recipe only makes one bowl, but it easy doubles so you can make one for you and whoever you love (or a giant one for you!!!). I wouldn’t try to make more than two at a time – you blender might not be able to handle it, especially if you’re making them ultra thick like me. Combine all ingredients except for the toppings in a blender. Puree until completely smooth - the mixture should be very thick. Add a touch more liquid if necessary to get it to blend completely smooth, or if you want a thinner smoothie. Transfer to a individual serving bowl and add toppings. Enjoy immediately! I’ve been addicted to smoothie bowls lately too, especially because it’s been SO hot out! This mango pineapple version sounds so fresh and delicious, Rachel! Definitely my kind of summer breakfast! Aren’t they the best?! Thanks, Gayle! OMG this looks so good, Rachel! I want a bowlful right now! It has been soooo hot here lately – all I’ve been craving are smoothies!! I really need to get on the smoothie bowl train – this sounds fantastic! The smoothie bowl train is the BEST train! Thanks, Ashley. This smoothie bowl is simply gorgeous! Love the mango pineapple combination. I wish I had one right now! Haha, me too! Thanks so much, Jen. I LOVE the flavors you’ve got goin’ on in this bowl Rachel! I can see why you’re addicted to smoothie bowls! And it’s just so pretty! You make the prettiest smoothie bowls, Rachel! I love how thick and creamy this one looks and the tropical flavors sound delicious! 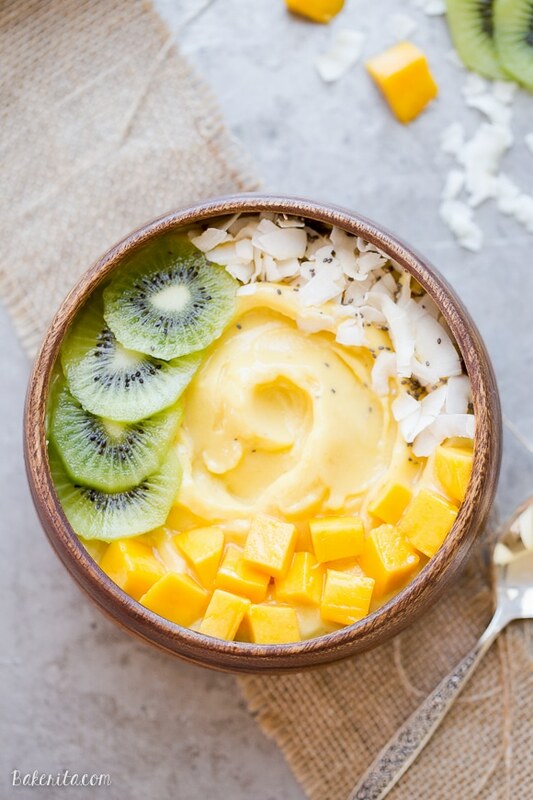 Your smoothie bowl is gorgeous, Rachel, and I LOVE the tropical flavored smoothies the best! Mango and pineapple are so refreshing together, and all of the toppings you have take it over the edge. This looks like something I need in the heat we’re having right now! This looks so yummy and thick! Thick smoothie bowls are always the way to go. These tropical flavors are great! I really dig the coconut milk and kiwi in here! 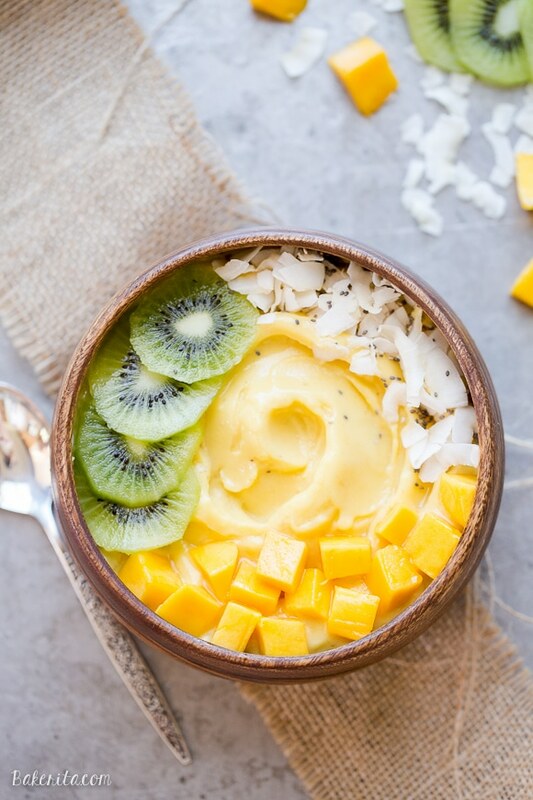 Smoothie bowls are so perfect to beat this summer heat! I love anything to do with mango, so this is a must-try in my book! Any idea about how many calories in this? Looks soooo good! Hi Madeline, it’s 366 calories without the toppings! Hey Rachel! This smoothie bowl looks delicious. Do you think it would work to add a scoop of protein powder while blending with the fruit? Without some sort of protein in the morning, I feel like I get hungry again too fast. Thanks! Hi Devan, you definitely could. I love adding a scoop of Vital Proteins collagen to mine. I added granola to mine. Sooooo good! Yum! So glad you’re loving it Lereka. Hello. 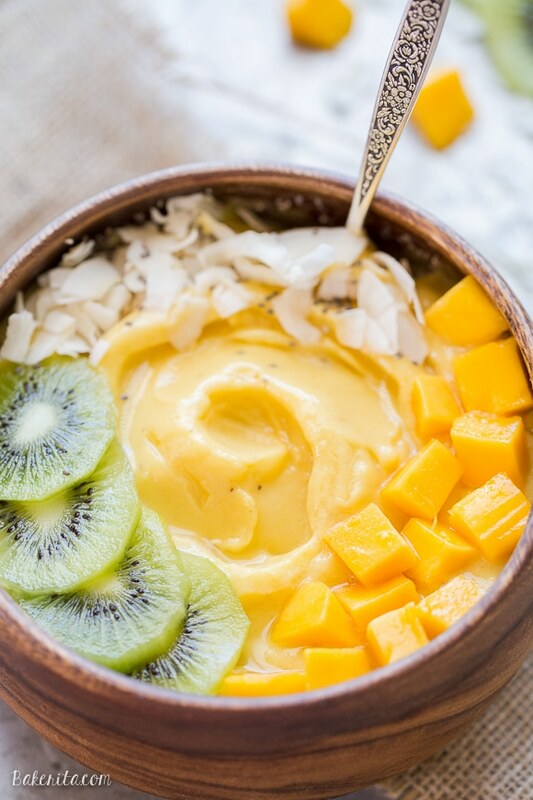 This may be a silly question – I think I already know the answer but just to clarify – the coconut milk in this MANGO PINEAPPLE SMOOTHIE BOWL recipe is the liquid kind you get in the refrigerated section of the grocery store yes? Not the canned, thicker kind? Thanks so much. Excited to try this! Hi Mags, yes I used the kind from the carton, not the can!